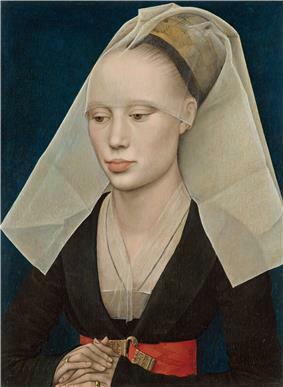 Rogier van der Weyden (Dutch: ) or Roger de la Pasture (1399 or 1400 – 18 June 1464) was an Robert Campin and van Eyck, as the third (by birth date) of the three great Early Flemish artists ('Vlaamse Primitieven'), and widely as the most influential Northern painter of the 15th century. There are few certain facts of van der Weyden's life. What is known of him beyond this has been woven together from secondary sources, and some of it is contestable. However the paintings now attributed to him are generally accepted, despite a tendency in the 19th century to attribute his work to others. Due to the loss of archives in 1695 and again in 1940, there are few certain facts of van der Weyden's life. Rogelet de le Pasture (Roger of the Pasture) was born in Tournai (in present-day Belgium) in 1399 or 1400. His parents were Henri de le Pasture and Agnes de Watrélos. He married around 1426, to Elisabeth Goffaert, and was made town painter of Brussels in 1436, and changed his name from the French to the Flemish format, becoming 'van der Weyden'. The Pasture family had settled before in the city of Tournai where Rogier's father worked as a 'maître-coutelier' (knife manufacturer). In 1426 Rogier married Elisabeth, the daughter of a Brussels shoemaker Jan Goffaert and his wife Cathelyne van Stockem. Rogier and Elisabeth had four children: Cornelius, who became a Carthusian monk, was born in 1427; a daughter Margaretha in 1432. Before 21 October 1435 the family settled in Brussels where the two younger children were born: Pieter in 1437 and Jan the next year. From the second of March 1436 onwards he held the title of 'painter to the town of Brussels' (stadsschilder), a very prestigious post because Brussels was at that time the most important residence of the splendid court of the Dukes of Burgundy. 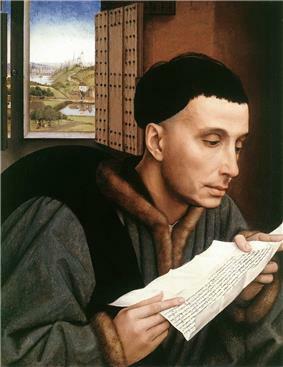 On his move to Brussels, Rogier began using the Flemish version of his name: 'Rogier van der Weyden'. Little is known about Rogier's training as a painter. The archival sources from Tournai were completely destroyed during World War II, but had been partly transcribed in the 19th and early 20th century. The sources on his early life are confusing and have led to different interpretations by scholars. It is known that the city council of Tournai offered wine in honour of a certain 'Maistre Rogier de le Pasture' on 17 March 1427. However, on 5 March of the following year the records of the painters' guild show a 'Rogelet de le Pasture' entered the workshop of Robert Campin together with Jacques Daret. Records show that de le Pasture was already established as a painter. Only five years later, on the first of August 1432, de le Pasture obtained the title of a 'Master' (Maistre) painter. His later entry into apprenticeship might be explained by the fact that during the 1420s the city of Tournai was in crisis and as a result the guilds were not functioning normally. The late apprenticeship may have been a legal formality. Also Jacques Daret was then in his twenties and had been living and working in Campin's household for at least a decade. It is possible that Rogier obtained an academic title (Master) before he became a painter and that he was awarded the wine of honour on the occasion of his graduation. The sophisticated and 'learned' iconographical and compositional qualities of the paintings attributed to him are sometimes used as an argument in favour of this supposition. The social and intellectual status of Rogier in his later life surpassed that of a mere craftsman at that time. 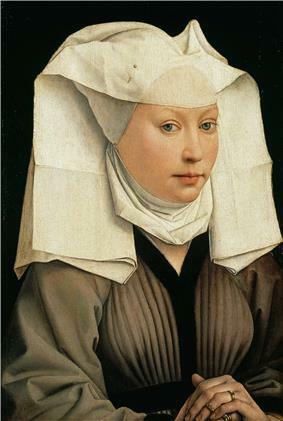 In general the close stylistical link between the documented works of Jacques Daret, and the paintings attributed to Robert Campin and van der Weyden, are the main arguments to consider Rogier van der Weyden as a pupil of Campin. The final mention of Rogier de la Pasture in the financial records of Tournai, on 21 October 1435, lists him as demeurrant à Brouxielles ('living in Brussels'). 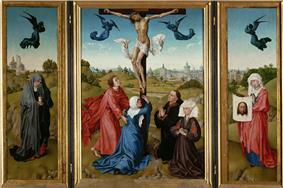 At the same time, the first mention of Rogier de Weyden places him as the official painter of Brussels. It is this fact that puts de la Pasture and van der Weyden as one and the same painter. 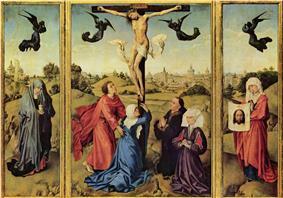 The post of city painter was created especially for Van der Weyden and was meant to lapse on his death. It was linked to a huge commission to paint four justice scenes for the 'Golden Chamber' of Brussels City Hall. Different properties and investments are documented and witness his material prosperity. The portraits he painted of the Burgundian Dukes, their relatives and courtiers, demonstrate a close relationship with the elite of the Netherlands. The Miraflores Altarpiece was probably commissioned by King Juan II of Castile, since Juan II donated it to the monastery of Miraflores in 1445. In the holy year 1450 Rogier quite possibly made a pilgrimage to Rome which brought him in contact with Italian artists and patrons. The House of Este and the Medici family commissioned paintings from him. The Duchess of Milan, Bianca Maria Visconti, sent her court painter Zanetto Bugatto to Brussels to become an apprentice in Rogier's workshop. Rogier's international reputation had increased progressively. In the 1450s and 1460s humanist scholars such as Nicolas Cusanus, Filarete and Bartolomeo Facio referred to him in superlatives: 'the greatest', 'the most noble' of painters. Van der Weyden died on 18 June 1464 at Brussels, and was buried in the Chapel of St Catherine in the Cathedral of St Gudulphe. No single work can be attributed with certainty to van der Weyden on 15th-century documentary evidence alone. However, Lorne Campbell has stated that three well-authenticated paintings are known, but each has been doubted or underestimated. 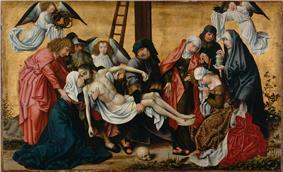 The best documented is The Descent from the Cross in the Museo del Prado, Madrid. Campbell points out that this painting's provenance can be traced in some detail from the 16th century. The Triptych of the Virgin or Miraflores Altarpiece, since 1850 in the Gemäldegalerie, Berlin, was given in 1445 to the Charterhouse of Miraflores near Burgos by John II of Castile; it was described in the deed of gift as the work of great and famous Flandresco Rogel. 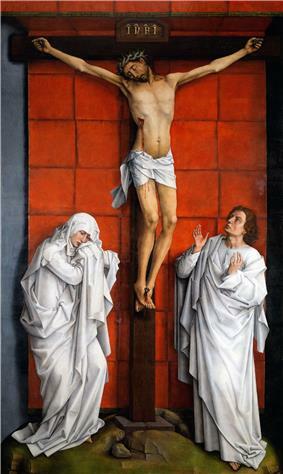 The 'Crucifixion', now in the Escorial Palace, was donated by Rogier to the Charterhouse of Scheut outside Brussels. 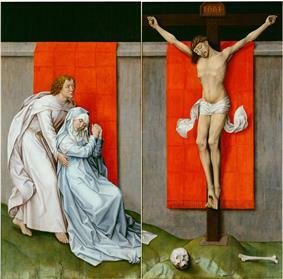 In his catalogue raisonné of Van der Weyden's, the Belgian art historian Dirk de Vos agrees with Campbell about the authenticity of these three paintings. Rogier's apprenticeship under Campin instilled a number of preoccupations, most noticeably his approach to feminine beauty, which was often expressed both through the elegant form of the model herself as well as her dress. Both painters positioned their models within strong diagonal lines, rendered either through headdress or folds of surrounding draperies or cloth. Both emphasised the vivacity of their model's character by contrasting them against dark flat backgrounds and throwing strong light from the near left hand side. Campbell compares Campin's with Rogier's Prado The Descent from the Cross in their emotional depictions of anguish. 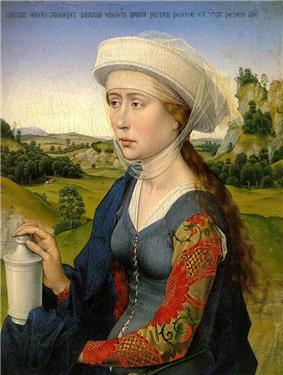 In fact the resemblance was to such an extent -compare Campin's Portrait of a Woman's similarity to Rogier's Berlin portrait, that Campin's works were for a period attributed to Rogier's early career. Relatively few works are attributed to van der Weyden's relatively long career, but this does not mean he was un-prolific, more that it is likely that many have been lost. Nonetheless, he had a very well defined style, and the majority of the attributions are generally accepted. Van der Weyden left no self-portraits. Many of his most important works were destroyed during the late 17th century. He is first mentioned in historical records in 1427 when, relatively late in life, he studied painting under Campin during 1427–32, and soon outshone his master and, later, even influenced him. 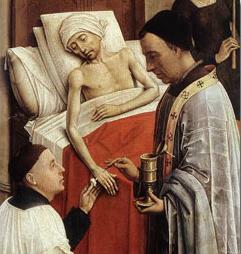 After his apprenticeship he was made master of the Tournai Guild of St Luke. He moved to Brussels in 1435, where he quickly established his reputation for his technical skill and emotional use of line and colour. He completed his Deposition in 1435, which as he had deliberately intended, made him one of the most sought after and influential artists in northern Europe and is still considered his masterpiece. The fragment of London National Gallery The Magdalen Reading has been described by Campbell as "one of the great masterpieces of fifteenth-century art and among Rogier's most important early works". 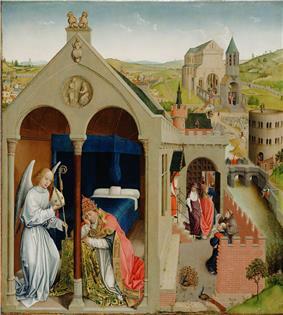 Since the 1970s, this painting has been linked to two small heads in the collection of the Calouste Gulbenkian Museum (Lisbon), of Saint Catherine and of St Joseph. It is now widely believed that these three fragments came from the same large altarpiece depicting the 'Virgin and Child with Saints', partly recorded in a later drawing now in Stockholm. At some unknown date before 1811, this altarpiece was carved up into these three fragments. 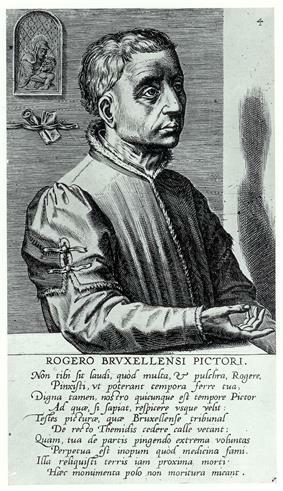 Rogier's once most famous work, Vasari (1568), Molanus (c. 1570–1580), and Baldinucci (1688). In his commissioned portraits, van der Weyden typically flattered his sitters. He often idealised or softened their facial features, allowing them a handsomeness or beauty, or interest or intelligence they might not have been blessed with in life. He often enlargened the eyes, better defined the contours of the face, and gave a much stronger jaw than the subject may have possessed in life. His vigorous, subtle, expressive painting and popular religious conceptions had considerable influence on European painting, not only in France and Germany but also in Italy and in Spain. 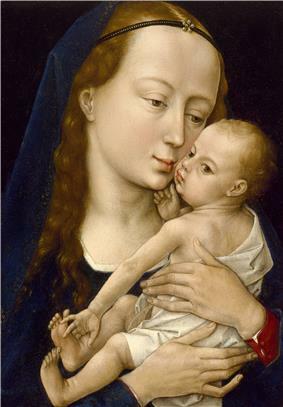 Hans Memling was his greatest follower, although it is not proven that he studied under Rogier. Van der Weyden had also a large influence on the German painter and engraver Martin Schongauer whose prints were distributed all over Europe from the last decades of the 15th century. Indirectly Schongauer's prints helped to disseminate van der Weyden's style. ^ a b Kemperdick, Stephan, Jochen Sander, Bastian Eclercy, Maître de Flémalle, and Rogier van der Weyden. 2008. The Master of Flémalle and Rogier van der Weyden. Frankfurt am Main: Städel Museum. p. 67. ISBN 9783775722599. ^ "Rogier van der Weyden". National Gallery, London. Retrieved 25 December 2010. ^ "'"Bust of 'St Catherine'? ; Bust of 'St Joseph. Museu Gulbenkian. 19 April 2009. Retrieved 28 July 2009. De Vos, Dirk. The Flemish Primitives. Amsterdam University Press, 2002. Dhanens, Elisabeth. Rogier van der Weyden. Revisie van de documenten. Brussels: Royal Academy of Belgium, 1995. Marzio, Peter C. A Permanent Legacy: 150 works from the Collection of the Museum of Fine Arts, Houston. New York: Hudson Hills Press, 1989. Snyder, James. Northern Renaissance Art: Painting, Sculpture, The Graphic Arts from 1350 to 1575. 2nd ed. New Jersey: Prentice Hall Inc. and Pearson Education, 2005.